I can’t believe that I am actually writing this! I never thought it could happen, especially to me. I am the fellow who is always so careful that I book my dental appointments a month in advance. I arrive super early for my flights, and I look down when I walk. But, it did happen, and there is no going back. I started counting the 10 hours and 35 minutes till we would land in Tel Aviv. We were up in the air for a few hours when I heard the stewardesses announce that the meals were coming through. I was asked if I get a kosher meal and I answered in the affirmative. A piping hot meal was set down before me. I recognized the name of the caterer and saw the clear kosher symbol of the kashrus agency certifying that caterer. And then, being quite hungry, I ripped off the packaging, took my fork and dived right in. The taste of the food was definitely different; it was something that I was not used to. I couldn’t place it. 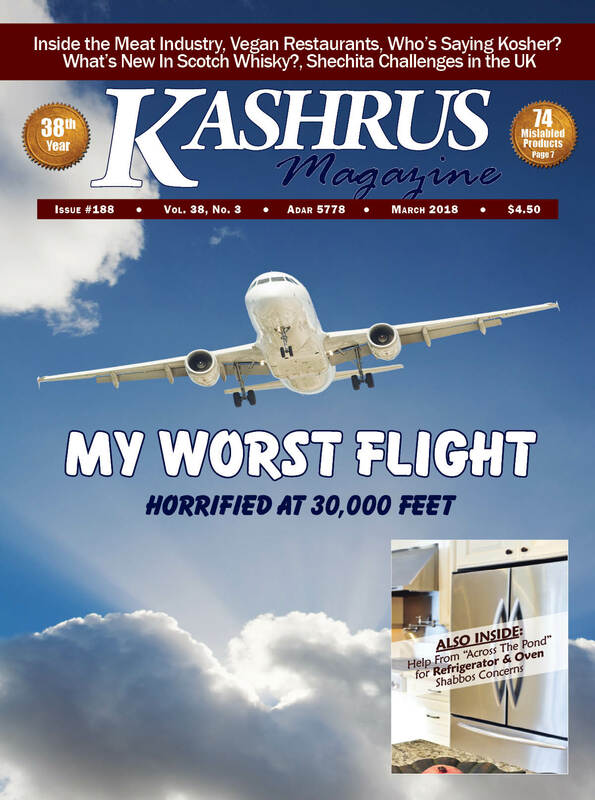 In the March 2016 issue of KASHRUS Magazine (“Refrigerators on Shabbos,” Vol. 36, No. 3, p.45), we featured a complete discussion of the Shabbos/Yom Tov concerns regarding refrigerators. Since then, a number of articles have been written on the topic. The “OU” did a feature story with inside information from those who repair refrigerators (2016 Passover Guide, p. 40). It is available now at https://tinyurl.com/jkvwfcs. Also, in the upcoming “OU” Pesach Guide, The “OU” plans to publish another article announcing a new GE product called “Shabbos Keeper,” which will be endorsed by OU, as well as CRC, Rav Shlomo Miller and Rav Mordechai Gross. Rabbi J. David Bleich wrote a review of the recent halachic literature referring to the Shabbos concerns with refrigerators (Refrigerators on Shabbat, Tradition Vol. 50, No. 1, Spring 2017, p. 54-85 ). And, most recently, the Beis Din of the Federation of Synagogues in London, England has been publishing a series of articles on the topic. Most recently, the Federation of Synagogues, London, England, has launched FedTech - a service whose focus is the use of appliances on Shabbos. Initially, with a focus on awareness of the issues surrounding the use of domestic appliances on Shabbos, the service developed an online resource for members of the public to learn how to select an appliance which complies with the requirements of shemiras Shabbos. In areas of the world where very few certified appliances are available, members of the public need to be properly equipped to decide how to go about choosing an appliance. The online articles are both eye-opening and informative, providing insight into the potential issues and how to resolve them. Rabbi Yisroel Moshe Guttentag, who is driving the FedTech initiative, expressed his gratitude to the Star-K’s Rabbi Yonah Ottensoser and to its rabbonim for the unfailing assistance they have provided in establishing this vital service for the shomer Shabbos community in the UK and Europe. Determined to assist members of the public in this area, FedTech is focusing both on raising awareness and on developing solutions to issues as they are raised. They are working closely with noted engineer Mr. Dovid Gurwicz, son of Gateshead Yeshiva’s beloved late Rosh Yeshiva HaGaon Reb Leib Gurwicz zt”l. 1. WHAT DO I DO TO DISABLE THE LIGHT ON A FRIDGE IF I CANNOT FIND THE SWITCH TO TAPE DOWN? In some cases, even if a magnet is in place, the lights nevertheless flicker momentarily. This would indicate that the magnet has not been accurately placed. The guide suggests that it is worth contacting a frum fridge mechanic whose experience will assure that the magnet is accurately placed. 2. IF I UNSCREW THE LIGHTBULB, ARE THERE STILL OTHER ISSUES OF WHICH I NEED BE CONCERNED? Light is operated by door. 3. ARE THERE ISSUES WITH REGARDS THE FRIDGE WHICH CAN NOT BE RESOLVED BY NEUTRALIZING THE SWITCHES? Appliances whose features make mention of finely calibrated fridge cavity temperature also raise alarm bells. Fast freeze “Power Freeze” will rapidly lower the temperature of the freezer once new items have been added, to ensure food is kept fresh and stored safely. Localized cooling offers to direct all the cold air present in the freezer to the specific area within the compartment where it is required. In some cases, this feature generally operates a series of small motors which close ‘dampers’ to focus airflow to the area where it is most needed. Vacation mode is used to keep foods cooled but to limit energy use. Where this mode is activated automatically, it is of concern as opening the door when in vacation mode can activate some of the appliance’s mechanisms. 4. HOW DO YOU RECOMMEND WE CHECK WHETHER TO BUY A PARTICULAR FRIDGE? Can the light bulb be unscrewed? Can a physical plunger switch be taped down? Will it be necessary to attach a magnet? Does the magnet disable the light? Does the fan sound? Listen for a quiet humming sound as the door opens. Can it be overridden by taping down switches/magnet? Does the LED screen change? Does an alarm sound when the appliance is left open for too long? Can it be neutralized with the help of a magnet? Read the fridge specification – are there advanced settings such as localized cooling or automatic vacation mode? Read Question 6 in the Fed Tech Guide for more information on this issue. 5. MY FRIDGE ALARM SOUNDS WHEN THE DOOR IS LEFT OPEN FOR TOO LONG – IS THIS AN ISSUE ON SHABBOS? In most appliances, disabling the door switch will resolve this issue. When the fridge alarm rings on Shabbos, it is forbidden to close the door to stop the disturbance. In rare cases, where the alarm is sounding in a particularly disturbing manner, it would be permitted to ask a non-Jew to close the fridge door or to disable the alarm in another manner. Switching the alarm off oneself, however, is not a valid option. In cases where the door switches have already been disabled before Shabbos, the alarm will generally not ring. In some appliances, the alarm is not activated by door opening and will not be disabled by door closing; instead, the alarm is sounded when the internal temperature has risen too high. If this is the case, closing the door would not directly deactivate the alarm; rather, the alarm will continue to ring until the desired temperature has been attained. Closing the door is permitted under these circumstances as the interaction with the appliance’s electronic controls is considered indirect. 6. THE OVEN I AM BUYING ADVERTISES A ‘SABBATH MODE’. WILL THIS GUARANTEE THAT I NEED NOT WORRY ABOUT ITS USE ON SHABBOS? Unless it has been designed with Rabbinic input, the existence of a Sabbath mode by no means assures that all potential halachic challenges have been resolved. There are two major areas of concern with regards the use of an oven on Shabbos. Some appliances directly trigger heating elements, fans or lights as the door opening is detected. Others, although less problematic, still operate thermostatically and react to cold air introduced. The following questions can be used to assess whether an oven, can be used on Shabbos. The questions are relevant even if the appliance offers Sabbath mode – as long as the appliance does not carry certification. Does the light turn on/off when the door is opened/closed? Do icons appear/disappear when the door is opened/closed? Does the fan start/stop when the door is opened/closed? At the end of a timed cooking program, are alarms deactivated by opening the door? Can you find the door switch and tape it down? (Users should be aware of the safety implications of taping down the plunger switch of an oven door). Can a magnet be placed in front of the magnetic door contact switch to trick the oven into thinking it is closed? (Users should be aware of the safety implications of leaving magnets in place in an oven). Does the appliance have a programmable timer which can be set to cease all appliance activity? If the appliance has a programmable timer, it can be used provided food is left inside before Shabbos and only removed once the program has concluded. Once the timed program has finished, does the alarm deactivate automatically (without the need for pressing of buttons)? Does the appliance display an icon when the heating element is active? If the appliance has an ‘element on’ indicator, the door may be opened when the element light is on. In many appliances this light no longer features. FedTech are working to develop possible solutions to this issue. FedTech can be contacted from “this side of the pond” by texting them in the UK via their ShailaText service at 011447403939613, or by emailing them at technology@federation.org.uk. This article was prepared with assistance from Rabbi Yisroel Moshe Guttentag, head of the Federation of Synagogues FedTech initiative, London England. The Federation Beis Din is headed by Dayan Y.Y. Lichtenstein shlita. The Beis Din offers centralized communal services, including gittin, dinei Torah, marriage authorization and support for its network of community rabbonim. The Federation’s Kashrus department, KF Kosher, certifies a wide range of products and ingredients, including Red Bull and Wrigley and is directed by Dayan Moshe Elzas, a great expert in industrial kashrus. Scotch malt whisky is made from two key ingredients: barley and water. Right? Wrong! That was the exclusive way it had been for 150 years or more, but, as of now, the game is changing. In the good old days, the production of Scotch malt whisky involved several stages including barley production, grain trading and storage, malting, distilling, bonded storage, bottling and sale. That was it, plain and simple. And rabbis, even those with very long beards, permitted drinking it without necessitating any kosher supervision. Then came Macallan Highland Single Malt Whisky. They were the first to publicly proclaim the use of sherry casks to perfect “the bouquet” of their single malt Scotch whisky. Some rabbis became concerned, but they permitted the blended scotch whisky. In today’s world, most rabbis in this country show concern for liquor produced in sherry or other wine casks, although many rabbis elsewhere continue to be lenient. That was the way it all was until now. The big news is change. People are constantly trying to improve on a good thing. And the biggest area of change is infusion. Infusion of liquor is when you take a liquor and mix it with vegetables or spices to infuse the taste into the liquor. Then you discard the spices, strain, and enjoy. The new idea today is that companies are making infused Scotch whisky and promoting it with the description that it is Scotch whisky. For example, Compass Box Whisky Co. makes a product called Orangerie Scotch Whisky Infusion. But the sherry wine casks are not the only problem with Orangerie. Compass Box infuses smooth, sweet Scotch whisky with the hand-zested peel of Navalino oranges, and subtle accents of Indonesian cassia bark and Sri Lankan Cloves. A blend of Highland single malt and single grain whisky from Fife, it shows notes of freshly peeled oranges, Xmas cake spices and vanilla. Sounds like it needs a kosher supervision, but it does not have one. Compass Box is not alone. On January 24, 2018, the Wall Street Journal featured an article entitled, “If You’re a Purist About Scotch Whisky, You Might Find This Hard to Swallow.” Saabira Chaudhuri detailed the efforts of Diageo PLC to challenge hundreds of years of tradition in the making of Scotch. Diageo is a British multinational company, the maker of Johnnie Walker, Crown Royal, Seagram's, Talisker, J&B, etc. — the largest distiller of Scotch in the world. In 2003, Diageo slapped the name of one of its single-malt Scotches onto a blended Scotch. Diageo called it a “pure malt.” The Eden Mill Distillery in St. Andrews, Scotland, asked the Scotch Whisky Association in 2016 to allow it to use chocolate malt to make its Scotch. Diageo wants to develop “Scotch whisky infusion,” a new category of flavored or low-alcohol blends sold under existing Scotch brands. So, we see that kosher supervision for the liquor industry is not a bad idea after all.